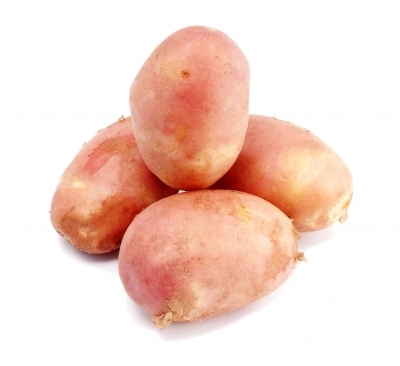 Potatoes are available in a wide variety of shapes, sizes, and colours, including white, gold, pink, red, blue, and purple. Shapes range from slender fingerlings to large ovals to little nuggets. Potatoes are not only a source of good carbohydrates, but also protein, vitamins B and C, potassium, iron, and copper. Red and blue potatoes contain additional health-protecting antioxidants that give them their bright colours. When can I plant potatoes? Plant seed potatoes (whole small tubers about the size of an egg or 1.5-2 inch pieces of larger tubers that have been cut up, each with two or three eyes) between March and May. They will grow best if started when temperatures range from 55-70 Fahrenheit (10-21 Celsius). If you start them outdoors too early, they may rot. On the other hand, if you start them too late, they may not grow well, as potatoes evolved to grow best when days are shorter, so long summer days can be inhibiting. You can let your seed potatoes sprout before planting if you want to give them a head start. If you’re planting directly outdoors, start them 2-3 weeks before your last anticipated frost date and then succession sow every 4 weeks for a continuous supply until 12 weeks before the first anticipated fall frost. If you provide a cold frame, polytunnel, or mini hoop tunnel, you can start your first potato crops 6-8 weeks before the last anticipated frost and also extend your fall harvest later into the cold season (add some mulch for extra cold protection if you plan to do this). You can also extend your harvest by planting a mix of early-, midseason-, and late- maturing potatoes. Potatoes don’t like very hot temperatures, so in places with hot summers, they grow best in the spring or fall, but in milder climates, you can grow them throughout the summer as well. You can speed up the time to harvest by sprouting (chitting) seed potatoes before you plant them. If your seed potatoes have not yet sprouted, place them in an egg carton or tray with the eyes facing up and leave them in a spot with exposure to natural light until the sprouts are around half an inch long. How do I plant potatoes? Dig a trench 6-8 inches deep and plant your potatoes in it with the eyes or sprouts facing up, 9-14 inches apart (wide spacing will allow for the development of larger potatoes). Cover the seed potatoes with 3-4 inches of soil. When they are around 8-10 inches tall, add a couple more inches of soil from the edges of the trench to cover the stems up to the point of the first leaves, and repeat this process every 2-3 weeks. This “hilling up” prevents the tops of the potatoes from being exposed to sunlight, which causes them to turn green and toxic, and it creates a longer underground stem along which potatoes can form. What is the best method for hilling up potatoes? You can do this with soil, compost, or mulch materials such as shredded leaves or straw, either in a trench or a container, but if you’re using straw or other light materials, make sure that no sunlight gets through or the potatoes will turn green and toxic. Mulches have the advantages of conserving moisture, keeping the soil cooler in hot temperatures, and making it easier to harvest your potatoes, but they may also attract slugs and they don’t provide as much nutrition as soil, so you may get a smaller harvest with this method. You can add a layer of compost or soil from time to time when hilling up with lighter materials to block out sunlight and add nutrients. When hilling up, add soil or other material around the stem and lower leaves. You’ll get more potatoes with a longer underground stem, up to a point, but don’t bury all the leaves – there should be aseveral sets of upper leaves exposed to the sun. Recommendations for hilling up vary, with some gardeners saying that you should bury potato plants only to the base of the lowest leaves and others asserting that you should hill up to the point where only a couple of sets of leaves are exposed, and everything in between. Of course they all claim to get the best yields with their own methods, so you may need to experiment to see what works best for you. How far apart should I plant potatoes? There is plenty of conflicting advice about this. Potatoes will grow larger with more space, but if you’re happy with lots of smaller potatoes, you can get away with spacing as low 9 inches, as long as your soil is fertile and growing conditions are good. If you want big potatoes, give the plants at least a square foot of space each, and preferably a bit more. When growing potatoes in rows, most gardeners leave a space of anywhere from 18-36 inches between them. How big do potato plants get? Potato plants typically grow to 1.5-3 feet high and 1.5-3 feet wide. What type of soil do potatoes need? Potatoes grow best in loose, slightly acidic soil (pH as close to 5.5 as possible) that has been enriched with compost. However, in practice, most non-commercial home gardeners plant their potatoes in the pH-neutral soil favoured by other vegetables because it’s too challenging to create a special pH space just for potatoes. This may reduce yields a bit and increase the risk of a fungal disease called scab, but in most cases, potatoes will grow well enough in the pH-neutral range. When preparing your soil, add a couple of inches of compost before planting. Don’t use manure, as it puts the plants at greater risk for scab. Potatoes will not grow well in heavy, wet, or clay-type soils. If your soil is the wrong type, create a raised bed with the right type of soil, and if the soil is compacted, double dig to loosen it before planting. Can I grow potatoes in a container? Potatoes do well in containers or grow bags, as long as they’re large enough and have good drainage. Advice varies regarding minimum container depth, with recommendations ranging from 12-30 inches, though gardeners generally agree that the diameter of the container should be at least 10-12 inches. If you want to grow potatoes in a container, add 6 inches of fertile soil mixed with compost, place seed potatoes in at the appropriate spacing, and add 3 more inches of soil on top. As the plants grow, hill up by adding more soil, mulch, or compost, and water regularly, as soil dries out more quickly in containers. Many garden supply stores and companies sell special potato containers with bottom access, allowing for easy harvesting. Can I grow potatoes in the shade? Many gardening experts say that potatoes need full sun (at least 6 hours per day) to be productive, though some say that you can get away with partial shade (just 4-5 hours of sun per day), but your harvest may be delayed with less light. Don’t use fertilizers that are nitrogen-heavy, particularly in the later stages of growth, as this will encourage potato plants to put more energy into leaf production than tuber development. However, the plants do need some nitrogen during the first month of growth, which you can provide with fertilizer, compost, or plant material. Some gardeners recommend using a foliar feed of comfrey tea or liquid kelp every couple of weeks in the early stages of growth, before flowering. Others just add fresh nutritional plant material to the potato trench before planting (for example, seaweed or comfrey leaves) to feed their potatoes, and/or add a side dressing of compost, fish emulsion, or seaweed during the second hilling up. Potassium is the most important nutrient for getting a good yield from your potato plants. You can add this in the form of wood ashes or greensand, or choose a fertilizer that is lower in nitrogen and higher in potassium. Because recommendations regarding fertilizer frequency and type for potatoes vary from one source to the next, you may need to experiment to see what works best in your garden. You can stop fertilizing potatoes once the plants flower. What ongoing care do potatoes need? Weed regularly during the early growth stages. When the plants are bigger, they should be able to outcompete weeds on their own. If it doesn’t rain regularly, you’ll need to water regularly to keep the soil consistently moist, particularly after the plants flower. It’s better to water the soil directly, as getting water on the leaves increases the risk of fungal diseases. Stop watering when the potatoes are nearly ready for harvesting. Hill the plants up several times to ensure that the tops of the potatoes are never exposed to sunlight. Potatoes may take anywhere from 70-140 days to reach maturity, depending on the variety. Most early-maturing varieties are ready in fewer than 90 days, whereas late maturing types take around 110 days or more, and mid-season types are ready in about 100 days. How many potatoes will I get per plant? Estimates vary for this, and most give the expected yields in pounds. The reason expectations are so variable is that yields are affected by many factors. Gardeners who do give numbers estimate anywhere from 4-10 potatoes per plant, depending on growing conditions. When can I harvest potatoes? You can start harvesting potatoes when they’re still quite small (typically after 70-90 days) and the plants are still flowering, but for full-sized potatoes, wait until the plants have died back completely, and allow the potatoes to sit in the ground for 2 weeks longer so their skins toughen up and cure for long-term storage. If frost or very wet conditions are anticipated, you can cut the plants back early to force curing. Use a fork to loosen the soil surrounding the potatoes, being careful not to poke holes in any of them (this causes them to rot quickly), and then harvest by hand. If you accidentally damage any, use them right away because they won’t store well. Also, get rid of any green potatoes, because they will be bitter and toxic. Harvest potatoes on a dry day and allow them to air dry fully in a dark, sheltered place before storing them in a cool, dark, dry location (don’t store them in the fridge, as it’s too cold – ideal storage temperatures range from 40-50 degrees Fahrenheit/5-10 degrees Celsius). Brush the soil from your potatoes, but don’t wash them until you’re ready to eat them, as washing can reduce their storage time. Note: You can’t just leave potatoes in the soil until you need them like certain other root vegetables (for example, carrots). Left in the ground too long, they’ll sprout or rot. Why are my potato plants producing large green berries? Potato plants sometimes produce seed-filled berries around the size of cherry tomatoes. These are toxic, so don’t eat them. What’s eating my potato plants? Potato beetles are a common pest. The adults are striped and the larva are red with black spots. The eggs (which are stuck to the undersides of leaves) are orange. You can handpick these pests off your plants or keep them out with a row cover after planting. Some gardeners say that interplanting beans or marigolds reduces potato beetle damage. However, there is a risk that these plants will compete with the potato plants and reduce yields. Aphids and leaf hoppers may also eat potato plants, and these can be sprayed off with a blast from the hose. Why are my potato leaves pale and mottled? This is usually a sign of viral infection. In addition to affecting the leaves, yields are likely to be low. Prevent viruses by planting only certified disease-free seed potatoes. Why do my potato leaves have spots? This is typically caused by fungal blight, which hits either in the spring (early blight) or during the hotter weather of summer and early fall (late blight). Lower leaves develop spots or irregular dark patches first and then die off, with the infection spreading upwards, and potatoes may develop brown patches. You can reduce the risk of fungal blights by providing good growing conditions and overall nutrition, watering regularly (but not too heavily), watering the soil rather than the leaves, avoiding splashing soil onto the leaves, and removing plant debris regularly. Why are my potato plant stems turning black and slimy? This is caused by a bacterial infection called blackleg that usually occurs during wet weather. The base of the plant stems turn black and slimy, and the leaves change to yellow, then brown, then die off completely. Infected potatoes rot in the ground. The problem can usually be traced to infected seed potatoes or the introduction of bacteria through a puncture in the potato caused by insects or the scab virus. You can reduce the risk of this disease by planting only certified disease-free seed potatoes, planting small whole seed potatoes rather than cut sections, and rotating crops regularly. Why do my potatoes have rough, corky spots? This is caused by fungal disease called scab. It doesn’t affect yield or storage, but while still edible, the potatoes won’t be as good. To reduce the risk, practice regular crop rotation, grow potatoes in an acidic soil (5.5 or even a bit lower) and don’t apply fresh manure. Some potato varieties , including Caribe, Norland, Viking, Kennebec, and Gold Rush, are moderately resistant to scab, though no variety is totally immune. For a full list of varieties that are particularly vulnerable or resistant to this disease, see Alberta Agriculture and Forestry’s Potato Scab – Frequently Asked Questions page. Why are the tops of my potato plants dying early? This is usually caused by a fungus called verticillium wilt. Potato yields will be small to nonexistent with this disease, and if the plants do produce, the potatoes, though still edible, will be discoloured and won’t store well. Once potatoes have been affected, the disease can stay in the soil for up to 4-6 years, so you’ll need to plant subsequent crops somewhere else. You can reduce the risk of this disease by growing resistant varieties such as Century Russet, Gold Rush, Itasca, Ranger Russet, Reddale, and Targhee, and adding compost to the soil. Note: Many other plants are vulnerable to this disease, including pepper, cucumber, strawberry, raspberry, broad bean, beet, watermelon, artichoke, rhubarb, and eggplant, so these plants will also need to be planted elsewhere in the future. Why do my potatoes have discoloured rings? Leaves may turn yellow, then brown, and stems wilt due to bacterial ring rot, which also causes the potatoes to have discoloured rings or rot completely (sometimes the only symptom of this disease is ring rot in the tubers). This disease is usually caused by planting infected seed potatoes. Fortunately, the bacteria that causes ring rot doesn’t stay in the soil, so if you remove all the infected plants, your soil should be fine afterwards. Why are my potatoes lumpy and misshapen? Misshapen potatoes with a mealy texture are often the result of uneven watering (letting the soil dry out, then soaking them). Consistent watering should prevent this problem. How do I store potatoes, and how long will they keep? After harvesting, brush the soil from your potatoes, but don’t wash them until you’re ready to prepare them. Store them in a cool, dark, dry place, such as a basement or root cellar – not the fridge, which is too cold. Ideal potato storage temperatures range from 40-50 Fahrenheit/5-10 Celsius. Keep storage potatoes in cloth sacks, paper bags, or wooden boxes – not plastic bags. In good storage conditions, undamaged potatoes will usually keep for at least 1-3 months (some sources say that in the right conditions, you may even get 5-6 months of storage). Note: New potatoes taste fantastic, but they don’t store as well as mature potatoes, so eat them up soon after harvesting. Can I save my own seed potatoes? You can save seed potatoes from your own harvest, but this increases the risk of planting diseased potatoes and spreading that disease to healthy plants. If you’ve encountered no disease problems, saving your own seed potatoes should be fine, but if diseases are common in your area, it’s safer to buy certified disease-free seed potatoes. If you plan to save your own seed potatoes, use only healthy potatoes and store them in a cool, dark, dry place in cloth, paper, or wooden containers, as you would with potatoes you intend to eat. You can find more detailed instructions for seed potato harvesting and saving in the Agricultural Biodiversity Weblog article: How to Save Seed Potatoes by Jeremy Cherfas. A couple of days before planting, cut larger potatoes into 1.5-2 inch pieces, each with at least 2-3 eyes (leave potatoes the size of an egg or smaller whole). Let cut up pieces sit for 1-2 days in a dry place before planting to reduce the risk of rot. Can I eat potatoes once they’ve sprouted? You can still eat them after they sprout – just rub the sprouts off. Note: The exception to this rule is purchased seed potatoes, which should not be eaten because they may have been chemically treated. Can I grow potatoes from supermarket potatoes? This is possible in some cases, but risky. Potatoes purchased from a supermarket may introduce viruses to your garden, and once that has occurred, subsequent potato crops may be infected, along with other vulnerable vegetable crops. Also, if the seed potatoes are not high quality, yields are unlikely to be good. In addition, many supermarket potatoes are treated with sprout inhibitors, so they won’t grow at all. For these reasons, it’s best to purchase certified disease-free seed potatoes. The skins of potatoes are very nutritious, so for maximum health benefits, leave them on. How do I cook potatoes? Potatoes are versatile, so there are many great things you can do with them. They go especially well with rosemary, onion, and garlic, but work well with almost any herbs and spices. One of the easiest ways to cook potatoes is to cut them into quarters, toss them with olive oil, salt, pepper, and rosemary or garlic, spread them out on a roasting pan, and bake them for around 20 minutes or so at 450 Fahrenheit/250 Celsius or 30-45 minutes at 400 Fahrenheit/205 Celsius, giving them a stir or a flip once or twice during the cooking process. Time required to cook potatoes through will depend on the size of the pieces. If you’re looking for some great potato recipes, see Bon Appetit’s 38 of Our Favorite Potato Recipes Ever and the Epicurious Best Potato Recipes page. Do you need to boil potatoes before roasting them? Many cooks recommend boiling before roasting for best results, but I’ve found that roasting them unboiled works fine, and there are plenty of recipes for unboiled roast potatoes available online. A quick boil beforehand may provide slightly better results, depending on the recipe, but you can still get delicious potatoes if you want to skip that step to save time. BBC Gardening Guides. Growing Potatoes. BBC.co.uk. Haase, J. (2009). From Seed to Table: A Practical Guide to Eating and Growing Green. London, ON: Insomniac Press. Moss, W. (2012). Any Size, Anywhere: Edible Gardening. Minneapolis: Cool Springs Press. Pleasant, B. (2009). All About Growing Potatoes: Early, Midseason, and Late Varieties. Mother Earth News. Tozer, F. (2013). The New Vegetable Growers Handbook. Santa Cruz, CA: Green Man Publishing. Vanderlinden, C. (n.d.). Best Shade-Tolerant Vegetables. Mother Earth News. Wiggens, E. (2002). Verticillium Wilt of Tomatoes and Potatoes. University of Minnesota Extension.